← Destruction of the immediate and profound. Last year I was met with a rather unpleasant winter, which left me stumbling through 4 rounds of antibiotics for what initially appeared to be a sinus infection. After things continued to deteriorate, the severe pain left me with a brain that felt something akin to jelly -no doctor was able to pinpoint the problem. I began to be treated for migraines, but the “migraine” I was experiencing lasted all day, every day, for six weeks. Now in a seemingly justified severe episode of depression (surprise surprise) I was being told (by my doctor) to take a lot of percocet, something that I really didn’t feel comfortable with. However, I was wondering just how much effect those intense peaks of pain were having on my mood, and since I couldn’t function enough to really do anything anyway, I decided to start a mood chart. I started with just basic graph paper with my moods in red and the degree of physical pain I was in, in yellow. I quickly confirmed that once the amount of physical pain I was in reached a certain level, my mood began to plummet. No surprise there! But the small amount of charting I did really began opening my eyes to many of the other benefits one can gain from keeping a mood chart. For people with bipolar disorder or other intense mood swings, mood charts can be helpful in a number of ways. Keeping a record of one’s mood requires the person charting to take a moment and pinpoint what is happening, meaning it requires a raised awareness of our mood changes. Having an awareness of what our mood is doing is half the battle! I know that for myself at least, I don’t always notice an irritable or slightly elevated mood (because I’m too distracted) so having to reflect on my day and what my moods were like has had a huge impact on my awareness. That raised awareness can help considerably in identifying potential triggers. Once we have noticed that our mood has changed, it gives an opportunity to reflect on what may have caused the change. Being able to do this when we can still remember what happened the day before, for example (instead of what started causing my current episode a week ago) means having a much more accurate idea of what those triggers could be. Having even a loose grasp on what our triggers are can help in avoiding future episodes, or in preparation for ones that are unavoidable. Being aware of where our mood is at can also be extremely helpful in curbing a potentially big episode before it gets completely out of control. This might not seem like a huge deal, but being able to call your psychiatrist and make a quick medication change, for example, before hypomania escalates into a full on manic episode can save an incredible amount of grief later. Any chance I have to avoid a potentially embarrassing, expensive, or debilitating episode is something I am enormously grateful for! I am someone who has a seriously difficult time remembering what has happened over the last few months when I’m visiting my prescribing doctor. Keeping a mood chart has helped significantly in being able to relay information to both my doctor and therapist. On top of that, I’ve been able to become familiar with my patterns, how long my mood cycles last generally, and what kind of episodes I’m having. Before I started charting, I knew I had elevated moods at times but I couldn’t tell my doctor how intense they were or for how long, or even when. Charting has helped me quantify these changes in mood, making them easier both to understand and cope with mentally. Knowing an episode is of a finite length does wonders for me, and helps me remember that the episode is going to end, even when the agony feels infinite. Have you ever had a moment where you aren’t sure if a medication you’re taking is really helping? Taking the time to keep a mood chart can give you a baseline for any changes you make down the line, including adding and subtracting medications. Sometimes it can be difficult to truly recognize improvement in our symptoms, so having a visual confirmation of change can aid in the decision making process in regard to medication. For better or worse, it is widely accepted in the medical world that bipolar symptoms can change over time. Keeping a record of your symptoms through mood charting definitely can’t hurt in the long-run. This entry was posted in Bipolar, Newly Diagnosed and tagged Bipolar, Depression, Health, hypomania, Mania, mental health, mental illness, mood chart, therapy, triggers. Bookmark the permalink. Great point Candida, I definitely agree. Personally I am more concerned about avoiding the big depressive episodes than the manic ones, so anything I can do to help in that arena is completely worth the effort in my book! I just started charting again. I stopped for awhile, for whatever reason. For some people, this may help. There are apps for it. I use one on Blackberry. It’s not the best, but can be, if there are a few tweaks. In charting, I find it useful to include the weather, the number of hours of sleep I got, the medicine and / or supplements I took, (or didn’t take) and any special circumstances in the notes. For instance, I was in court today. I don’t do that every day. So, it would stand to reason that my mood might be off the trend. All of these factors are heavy weights in mood shifts. I have made a correlation between getting less than 7 hours of sleep and sparking hypomania under the right circumstances. Contrastingly, if I get under 7 and over 9 hours of sleep during a depressive episode, it can stand to deepen it. Too little sleep, and I’m not solid enough to take daily stressors. Too much, and I’m easily fatigued because of I didn’t move enough that day. Exercise is important too, but I use that as a tool to lessen the intensity of episodes, as opposed to having to regulate it for the sake of a mood episode. Absolutely, answer D) all of the above! This has been an inspiration to keep on charting. I think I want to keep a log, and then make a graph every so many months. Something to keep in my records. I hope there’s more to come! This is fascinating! 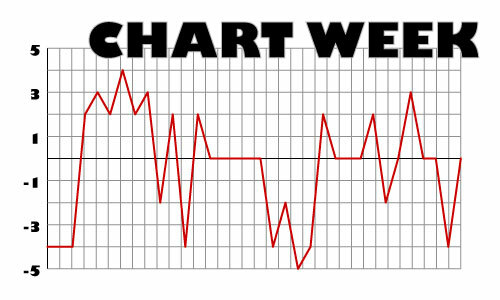 Yay, Chart Week is here! Nice examples and explanations of why to do it. I don’t think 5 minutes to devote to charting is a big deal. Most of us probably spend a lot more time just worrying about bipolar-related stuff! I definitely second the value of being able to relay information and monitor reactions to meds. I’d also note that it’s really valuable for reminding yourself that you really do have issues that you really do need to take meds for. Too many people with bipolar disorder talk themselves out of believing they need help as soon as they feel stable for a little while. Keeping a mood chart helps remind me why I’m doing all the stuff I’m doing to manage the illness. I absolutely agree that charts are a great reminder to stay on the medications that work, exactly what I was alluding to! Forgetting about how bad things are when we’re at our worst is something that happens to a LOT of people, and charting is a great reminder of the seriousness of this disorder and how important it is to maintain it! I like that mood chart diagram- easy way to chart it…why haven’t I thought of it before? Thanks! Thanks! There are a lot of programs that are capable of making good charts… I’m going to talk a little bit more about that later in the week, so check back by if you’d like! That first bullet’s the hardest thing to do. Many times are much ‘easier’ to simply sit. Active times are too active for that! Lately I’ve noticed a tendency to really spread out my activity too. TOO MUCH. I’ve got a hundred different things going on in my house right now. What a mess it is! I agree, and I’ve found that even as much as I feel like I improve in that area, I realize very quickly I can still do much more to improve. I have a hard time with overextending myself as well, it can be incredibly difficult to reign it in when I *feel* well, or like I can take on a hundred tasks singlehandedly. Every day I’m reminded how complicated living with bipolar disorder really is. The good thing about awareness though is that once you begin, every little bit helps. It feels similar to me to a snowball rolling downhill, and it may take a while but it does eventually become big enough to make a difference. I’ve read your article with great interest, and I think that you could try use our app, which is a highly efficient mood tracker. Main advantage in comparison to paper and pencil methods is quickness, convenience and reminder option, which will help out to remember when the test should be taken. I’d love to hear your feedback about our app.